The memory and sacrifice of Navy Fireman Third Class, killed during the attack on the USS Oklahoma in World War II was honored on Monday February 4, 2019 at the National Memorial Cemetery of the Pacific. Bennett, whose name is recorded as one of the missing from World War II, was accounted for on August 13, 2018. 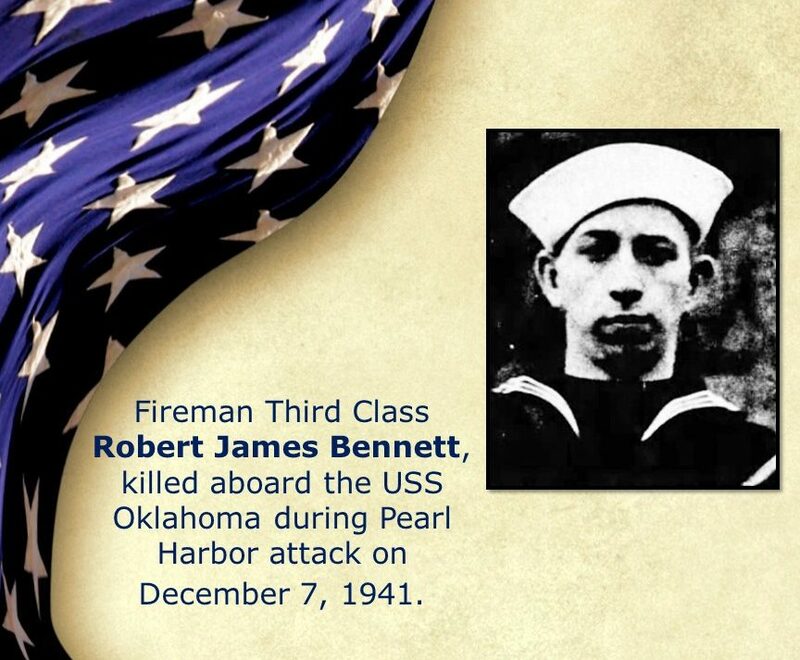 Fireman Third Class Robert James Bennett, who entered the U.S. Navy from Iowa, served on the USS Oklahoma (BB-37) and was aboard the ship during the Pearl Harbor attack on December 7, 1941. He was killed in the attack, and while his remains were recovered following the incident, they could not be individually identified at the time. F3c Bennett was initially buried as an unknown at the National Memorial Cemetery of the Pacific. In 2015, advances in forensic techniques prompted the reexamination and identification of F3c Bennett’s remains. Fireman Third Class Bennett is memorialized on the Courts of the Missing at the National Memorial Cemetery of the Pacific. https://dpaa.secure.force.com/dpaaProfile?id=a0Jt0000000XeKKEA0In 2015, DPAA disinterred remains from the National Memorial Cemetery of the Pacific, known as the Punchbowl, in Honolulu. Bennett’s name is recorded on the Courts of the Missing at the Punchbowl, along with the others who are missing from World War II. A rosette will be placed next to his name to indicate he has been accounted for.